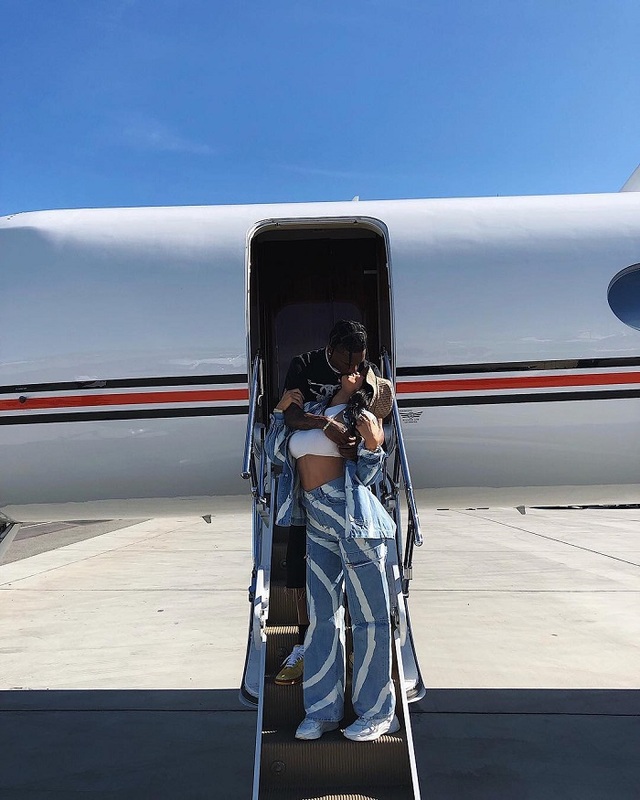 Kylie Jenner, 21, and Travis Scott, 27, are in California to attend the Coachella Valley Music and Arts Festival. On her Instagram, the reality show star posted a romantic photo of the couple kissing passionately on an airstair. Kylie had chosen to wear a comfortable jeans costume that she had combined with a white top and athletic shoes. Fans expressed their joy for the couple who will be spending their vacation during the music festival. Earlier, Kylie had posted photos of her vacation. In the photos, Kylie is sitting on Travis with her knees bent. In the first photo, she is holding a cup, and her love is holding her. Jenner had selected a tiger print swimsuit for the beach vacation, and the rings and earrings complemented.